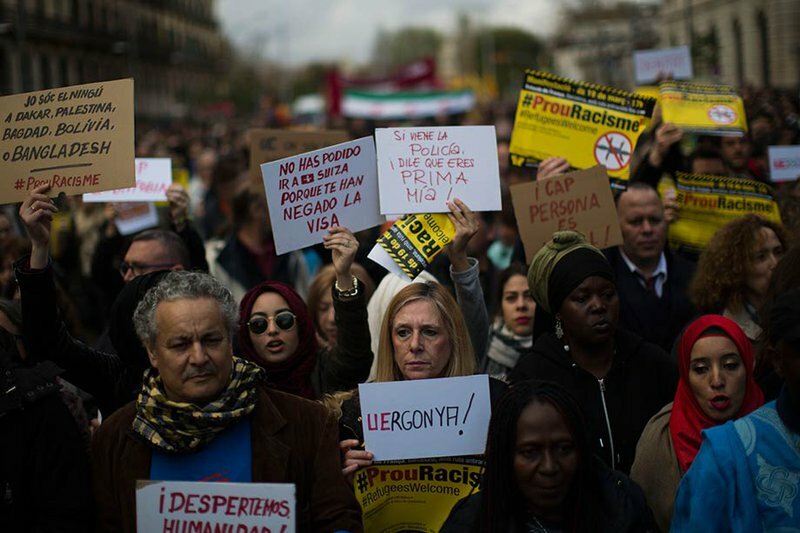 Demonstrators take part in a protest in support of refugees and migrants entering Europe, in Barcelona, Spain, Saturday, March 19, 2016. Emilio Morenatti/Press Association. All rights reserved. As migration has become a major issue of debate within Europe, and as states have pursued divergent policies on migrant reception and accommodation, cities have come to the fore as major actors in the reception, relocation and integration of refugees and migrants. Across Europe, as political arguments and differences have arisen over migration, transformative and cooperative models of welcome for new arrivals and people in transit become ever more important. With these challenges in mind, the United Nations University Institute on Globalization, Culture and Mobility (UNU-GCM) partnered with openDemocracy and the School of Law, Queen Mary University of London to organise Cities of Welcome, Cities of Transit, a conference that took place in July 2016 in Barcelona. The conference brought together academics, practitioners, policy makers and activists in order to exchange insights, extend networks and produce recommendations for the safe and orderly governance of migration in ways that foreground human dignity. The conference was broken down into four main sessions, each of which will be presented in turn over the course of this week from Tuesday onwards. But on Monday, we begin with the framing thoughts of Anna Terrón Cusí, Chair of the Advisory Board of the UNU Institute on Globalisation, who explains firstly how this is a European crisis, not a refugee crisis; and secondly, how we have to rethink some fundamentals because "a world where everything but people is moving around is simply not possible". Next, the conference opening address from Ignasi Calbó, Director of the Barcelona City of Refuge program, Barcelona City Council, and his colleague, Ramón Sanahuja, Director of Migrants attention and hosting, Barcelona City Council. In September 2015, Ignasi Calbó was appointed by the Mayor of Barcelona, Ada Colau, to assist all refugees arriving in the city of Barcelona, and to build a comprehensive, permanent and holistic model of how to provide them with the necessary services as well as rights. Together with his colleague who has been responsible for immigration and intercultural policies, as well as international cooperation in the city of Barcelona, Ramón Sanahuja, they outlined some of the details of this ambitious new programme to a packed audience at UNU-GCM, having given us some of the background story to Barcelona as a City of Welcome. Afterwards, we welcomed the chance to discuss with them whether states and local governments are working against each other when it comes to refugees. On Monday as well, we introduced you to two of the many social movement activists whose knowledge and commitment, both City Councillors agree, are so important for their plans. Bue Rübner Hansen, a post-doctoral researcher and participant in the refugee city group of Barcelona en Comú, kicks off with his thoughts on what Barcelona is hoping to achieve and is then joined by Manuela Zechner, cultural worker with Barcelona en Comú and Murmurae and research fellow at the Berlin Institute for Migration Research, to tell us more about the work of the social movements and neighbourhoods in Barcelona and their networks, and the contribution that they are making. On Tuesday, we looked at the ways in which cities are actively developing their own strategies to welcome migrants and to share best practice amongst themselves. The diverse responses of cities such as Gdansk and Karlsruhe to recent migrant arrivals illustrate how cities are redefining themselves as influential policy actors. Thomas Jézéquel, policy advisor for migration & integration at EUROCITIES, has been working on “city-to-city support on migrant integration”, a pilot peer mentoring project involving 15 cities across Europe. He tells us how Gdańsk in Poland became a city open to migration and diversity. Suzanne Asche is head of the cultural department of the German city of Karlsruhe including its libraries, museums, art galleries and festivals, and responsible for human rights, tolerance and cultural diversity in Karlsruhe. She remembers well how German cities found themselves on their own welcoming refugees, and explains how the city’s arts and artists have stepped up to the challenge. Cecile Riallant has been managing the Joint Migration and Development Initiative (JMDI), a global UN/IOM inter-agency programme focused on reinforcing the role and positioning of local authorities, including cities, in linking migration and development. She gives us a sense of the development potential of migration, if countries and cities can link with each other at the local and regional level, to work together and to evolve best practice. Lastly Patrick Taran, President of Global Migrant Associates, who teaches at the Geneva School of Diplomacy and the ILO International Training Centre in Turin addresses three thorny questions in this three part-interview: Is Europe being overwhelmed by irregular migrants? Can migration help stop Europe’s workforce from shrinking? How can we stop forced movement in the future? "If we are talking about addressing the causes and consequences, it seems to me that the place to start if we really want to resolve the problems, reduce the current emergency and prevent future large movements of people who move en masse because they have no choice – then we also need to be looking at mega-state policies in terms of seeking negotiated peaceful solutions to conflict situations, withdrawing arms, and reducing if not stopping arms sales." We focus in on the challenge on Wednesday. State policies across Europe do not always facilitate integration in this way. Despite this, citizens, activists and local governments are coming together to create a ‘culture of welcome’ for refugees. By examining how various players interact on the ground, can new strategies be developed to ensure a better welcome and enable more citizens to get involved? Can such networks develop sustainable practices of social composition beyond the aggressive politics of monocultural identity? We look at the evidence. Rocio Cifuentes, director of the Ethnic Youth Support Team and the Think Project in Wales, brings her own specialist message of hope on the subject of community integration and cohesion in a rapidly changing world, with her account of how to tackle Islamist extremism in vulnerable Muslim young people as well as far right extremism in vulnerable white young people, using a proactive, preventative and education-based approach to diversity. Followed by Saint Louis University-Madrid Campus academics Joan Pedro (media and communications) and Simona Rentea (international relations), both social movement activists in Spain, on how to build the connections that make a difference, Bue Rübner Hansen (see Monday) picks up Rocio’s theme, to tell us about the Aarhus anti-radicalisation programme in Denmark (see above). Thursday moves to the third session of the Barcelona conference, on the recent, controversial, EU-Turkey deal. We can only offer a few highlights, but please see the conference programme for details of speakers and their contributions in this great panel organised by the Department of Law at Queen Mary University of London (QMUL). The increased delegation of border controls to Frontex and the militarisation of the border via the deployment of NATO forces impacts on international and European human rights and refugee law. Is the European Union’s proposed partnership with Turkey, in which Turkey will receive a considerable number of refugees from the European Union, a real solution to the failure thus far of EU refugee relocation initiatives? NGOs and the UNHCR have already raised serious concerns regarding the legality of this move and its compatibility with international and European human rights and refugee law, asking whether there can be common ground for a European law of welcome. Valsamis Mitsilegas, Professor of European Criminal Law, Director of the Criminal Justice Centre and, since 2012, Head of the Department of Law, QMUL, begins the debate by exploring the concept of solidarity in EU law, and particularly the Dublin Regulation and related case-law. The centrality of the state in this paradigm places considerable limits on effective and human-rights compliant responses to refugee flows. But there are alternatives, which could ultimately lead the way in Europe to establishing a constitutionally uniform refugee status. Eleni Karageorgiou doctoral candidate in Public International Law at Lund University, Sweden, previously worked for the Greek Asylum Appeal Committees, representing its national Commission for Human Rights. She argues that both the Dublin mechanism within the EU and the EU-Turkey deal use solidarity as a euphemism for avoiding or shifting responsibility and, ironically, for de-solidarising protection, instead of signifying a humane policy. Aikaterini Drakopoulou is a Greek Attorney at Law and Member of the Athens Bar Association since 2009. In 2011, she joined the Legal Department of the Greek Council for Refugees – one of the main Greek NGOs in the field of refugee protection – providing individualised legal aid and counselling, and conducting legal research, monitoring both in Athens and the eastern Aegean Greek islands. In Unsafe Turkey, unsafe Europe, she cooperates with Sergio Carrera, senior research fellow and Head of the Justice and Home Affairs Programme at the Centre for European Policy Studies (CEPS), to explore the high political, legal and ethical cost of the dramatic decrease in the number of entries of asylum seekers to Greece. In his presentation, Sergio Carrera lays out the consequences of this “crisis-led way of doing policy, taking rapid decisions which prevent proper scrutiny and democratic debate” in Europe, and concludes that “we can talk about what solidarity means, but when it comes to the rights of people, these are obligations, and it is a responsibility of states to comply with those rights." Meanwhile, Niovi Vavoula, a research assistant at Queen Mary University of London's law department, has been finalising her research on EU immigration databases and privacy, and working with the European Criminal Law Academic Network and the New Journal of European Criminal Law. She tells us about Eurodac, a pan-European database that currently stores the fingerprints of asylum seekers and certain categories of irregular migrants. Its original purpose was to assist the Dublin system in identifying the country responsible for dealing with an asylum application. In 2013, the database underwent its first significant change; from a merely administrative tool, into a criminal law weapon, a powerful immigration control tool with significant repercussions for the fundamental rights of third-country nationals. Should we be concerned? The session ended with some answers to lively questions on the circle that is being squared by the European Union. As people do cross these borders, formal and informal ‘transit points’ for refugees take centre stage in the Mediterranean migration crisis, from the railway stations, parks, and abandoned buildings in European cities to the ‘jungle’ in Calais’, from the brand new ‘hotspots’ on Lampedusa to the Idomeni camp at the Greek-Macedonian border. These ‘points’ shape and are shaped by local/urban contexts and national and EU policies. This affects practices of solidarity and welcoming in a crisis too often framed in terms of threat and security. Today, Friday, we look at how these migration spaces affect the wider urban and political environment. Leonie Ansems de Vries is a Lecturer in International Relations at King’s College London and the co-Investigator of the ESRC-funded research project ‘Documenting the Humanitarian Migration Crisis in the Mediterranean’. She opens her panel debate by telling us about how the EU uses hotspots for what is seen as the essential business of sorting out, “Who should we protect, and who shouldn’t be protected?” This is a hugely problematic process which is ensuring that increasingly, these are places of hostility and pushback, not least because the sorting is done on the basis of your nationality, and not on the basis of individual rights and needs. However equally striking under these conditions, are “migrants’ continued efforts to move on despite bordering practices, to live their lives in dignity, and to build communities”. Marta Welander, the founder and Director of the Refugee Rights Data Project, argues that national/EU policies, little government support, and a lack of reliable data are contributing to a deep polarisation amongst European citizens in their response to the humanitarian crisis in Calais. On the one hand, current policies have generated high levels of solidarity among some British and French citizens: on the other, the same policies have fed into and exacerbated demonisation of displaced people in Calais, by framing them as ‘illegal’.